Diagasm You can forget about Universal Apps, we're not supposed to use that term from now on. When Windows 10 arrives, what Microsoft has so far been calling Universal Apps will be known as "Windows apps." That bombshell comes from Microsoft distinguished engineer Don Box, who spoke about the past and present of Windows at the WinHEC (Hardware Engineering Conference) in Shenzhen, China last week. "In Windows 10 we have this notion of a universal app platform. The apps that target it are called Windows apps. Sometimes we say 'universal apps' but we call them Windows apps," Box said. "Sometimes in a technical session we will talk about a Windows app, and a Windows desktop app. A Windows app runs on all devices. Windows desktop app: PC only." Don't worry, though. The style of software you've known and loved and/or hated isn't going away any time soon. "On PCs we still continue to support the two-decades plus of Windows desktop applications," Box emphasized. It is easy to see why Microsoft wants to push the idea that its new Universal App Platform (UAP) is now mainstream, and that what we think of as a Windows application today is more of a special case. It is an effort to steer developers to target UAP rather than Win32, the Windows API – which, as Box says, has been with us in some form or other for decades. Box also notes in the slide shown that "Windows apps" have advantages over desktop apps. They are self-contained, always signed, and their data storage is isolated for each user. In contrast, desktop apps are "opaque binaries" that are installed as "loose files." In other words, from a manageability perspective, new-style apps are a big win. Will this name change fly, though? Box is not quite correct in saying "a Windows app runs on all devices," not even if he's only talking about the subset of Windows devices. Windows 7 and below will not run these apps; in fact, even Windows 8 will not run them unless users take advantage of a free upgrade to Windows 10. On the phone side, you will again need to upgrade to Windows 10, which for some users means waiting while operators validate an update – something that may never happen. Older phones running operating systems earlier than Windows Phone 8 cannot be upgraded at all. Nor is it clear whether Windows RT devices, such as the original Surface, will ever support the UAP. 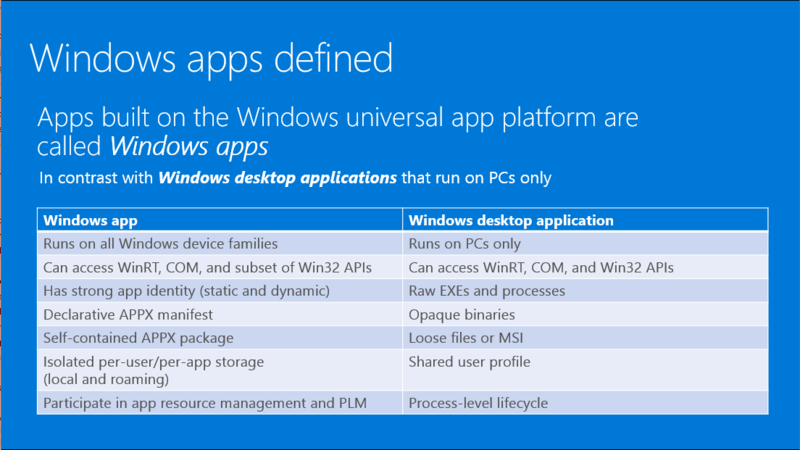 What Box means to say is that Windows apps run on all new Windows devices. But who can know whether Microsoft will remake its app platform yet again in a couple of years?